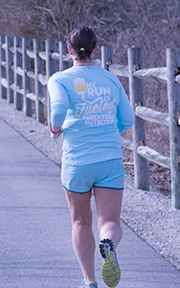 HPN consumers can request “This run is fueled by parenteral nutrition” for the back of the t-shirt. Contact Emma at emtillman@gmail.com if you’d like to order an Oley running shirt. I did a lot of brainstorming with my pharmacists and nurses at my home infusion company to come up with a plan that will allow me to train for, and run, marathons. If I run in the morning, I stop my nightly parenteral nutrition (HPN), then run—no pre-run hydration. If I run in the late afternoon or evening and I feel somewhat dry before starting, I sometimes infuse IV fluid (IVF) pre-run. This is more important if I will be doing a long run or be out longer than 2 hours or if it is really hot. I usually weigh myself pre- and post-run, calculate my sweat rate, and then replace fluid based on weight loss. I keep a spreadsheet of sweat rate, miles run that day, and the temperature outside. This helps me estimate losses and needs based on temperature and distance. For runs greater than 2 hours, I infuse IVF in an eclipse ball while running. The eclipse ball infuses a set amount of fluid in a set amount of time. I use a 500 ml ball that infuses over 2 hours. The advantage is that I do not need a pump and I do not need to worry about gravity. The ball pushes the fluid at a given rate. They have been used for home antibiotic infusions and work well for short and relatively small volume infusions. If my weight is still lower than my pre-run weight, I will often infuse hydration solution post-run. I have HPN 6 nights/week, so I typically schedule my day off HPN around a rest or easy workout day. I always do HPN the night before and after a long or hard workout. 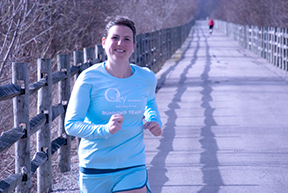 Emma Tillman is a long-distance runner, a pharmacist, and an HPN consumer (due to gastroparesis).